Conservation education is important to teach people of all ages, in both rural and urban areas, to appreciate the country’s natural resources and learn to conserve those resources for future generations. Through conservation education, people develop the skills necessary to understand the complexities of natural resource problems. 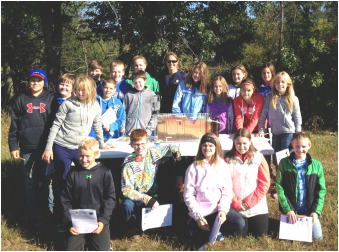 Sherburne SWCD provides education and outreach to both youth and adults through classroom presentations, workshops and field days. Sherburne SWCD is always looking for individuals and groups interested in volunteering to assist with projects. If you have an interest in natural resources, conservation, or just spending a few sunny days outdoors, we would love to have you join our team of volunteers. The roles of volunteers vary according to project needs. As a volunteer, you may assist with plantings, help staff with educational events and festivals, or lend a hand with other important project aspects. If you are interested in volunteering please contact Francine Larson at 763-567-5368. 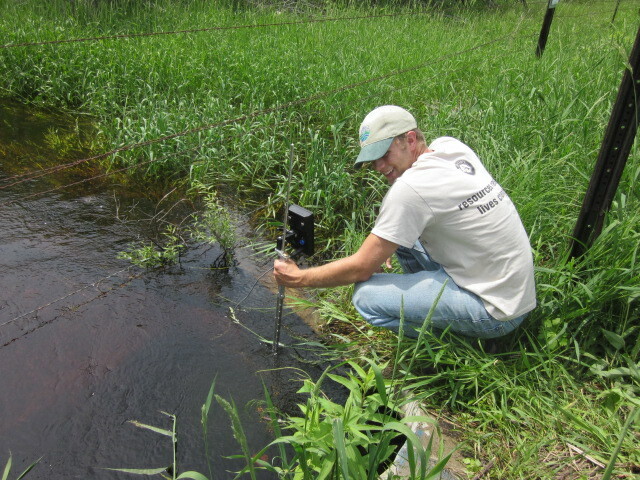 SWCD staff are available to assist teachers preparing lessons on topics including sustainable land use, watershed management, forestry, surface water quality, and ground water protection. Upon request, staff may also attend your class or youth group discussion on these topics. Presentations are also available for groups such as 4-H clubs, scout troops, civic groups and other organizations. Some topics include water quality, recycling, composting and backyard conservation. Please contact Francine Larson to see if these or other topics can be adapted to your group's interests, 763-241-1170 x 4. 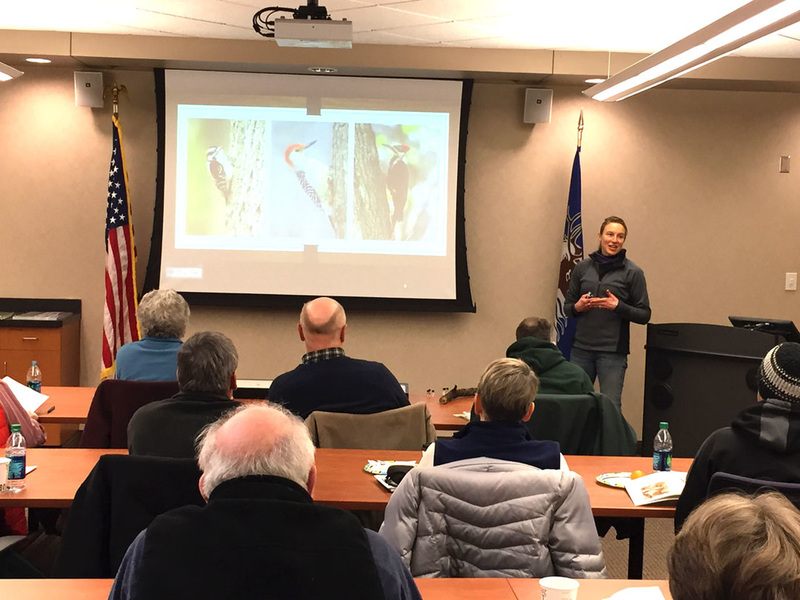 The SWCD hosts various workshops throughout the year to help educate Sherburne County residents about conservation issues. Please check our calendar or news section on the home page for upcoming events. 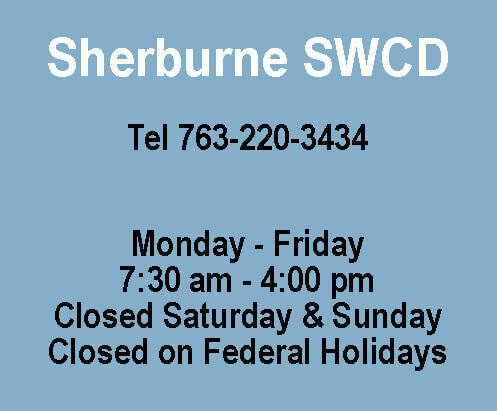 If you have any workshops that you would like to see Sherburne SWCD host, please submit your ideas. We would love to hear what our local residents want to learn! Sherburne SWCD has a display and information booth during the Sherburne County Fair to provide conservation information. Displays and educational material showcase the resources available to the public. SWCD staff are also on hand to answer any questions. In 2015 the SWCD installed a semi-permanent raingarden. The raingarden showcases a variety of native plants.Our booth is located by the entrance of the Commercial Building on the fair grounds. Sherburne County Fair Information. 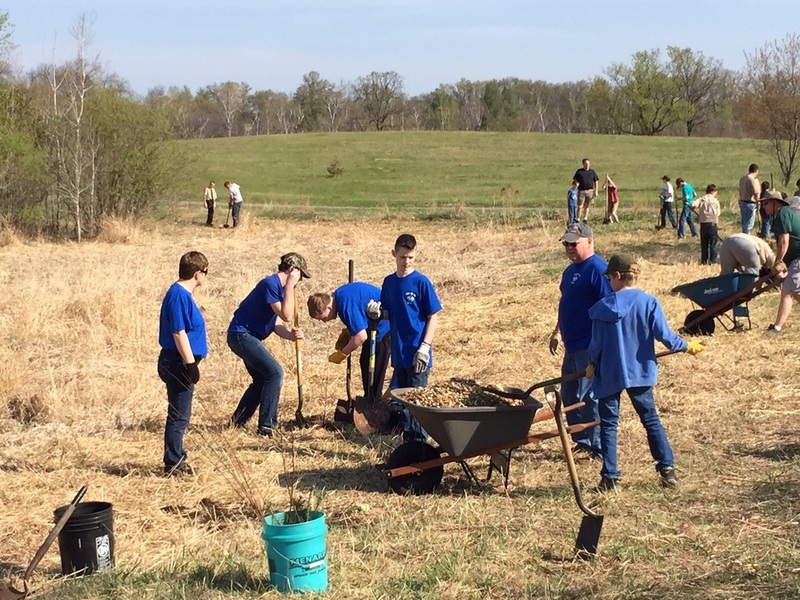 The Sherburne SWCD has partnered with the area Boy Scouts and Cub Scouts to plant trees in designated community parks each spring since 2009. Resource Conservationist, Gina Hugo, provides a tree planting demonstration to the Boy Scouts and community volunteers before the planting. Children and adults then work together to dig holes, tamp soil, and deliver water to the freshly set seedlings. It has become a very fun and successful event with over 350 trees planted in 2015. To learn more about this program or how your scout troop can participate, please contact our office at 763-241-1170 x 4. There’s no better time to get involved in some good clean fun than at the Elk River Watershed Cleanup! 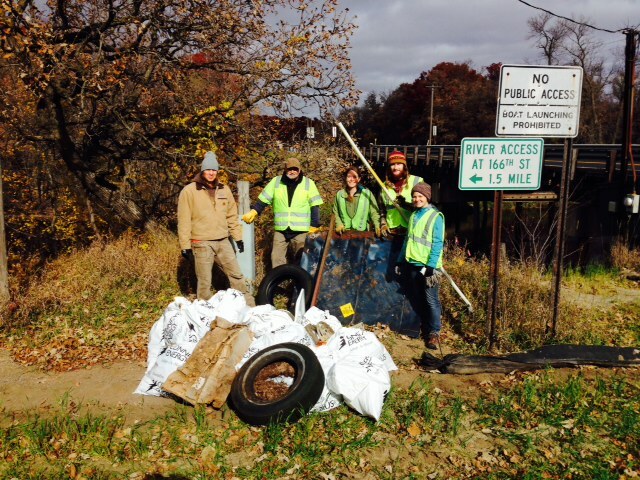 Since 2008 the Sherburne has removed over 3,500 pounds of trash from the Mississippi River with the help of volunteers like you. Let's make this year the largest cleanup event yet! Each year dedicated volunteers at three cleanup sites work to restore the beauty and integrity of our area. For information on how to volunteer or sponsor the event contact our office at 763-241-1170 x 4. 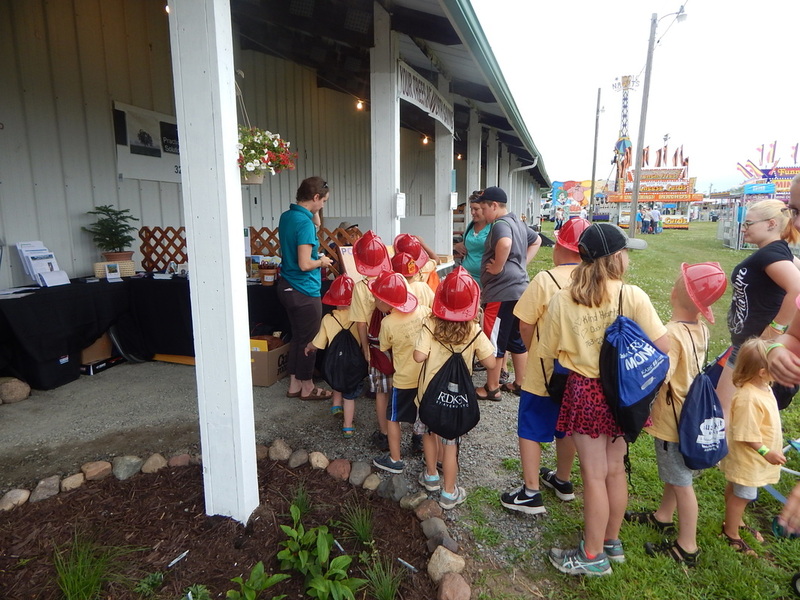 Sherburne SWCD has partnered with Farm Friends Barn to work towards providing an agricultural education exhibit for kids. Children become farm hands at this hands-on exhibit as they experience the agricultural process beginning at the farm and ending at the market. This mock agricultural adventure will consist of a series of livestock barns, a grain bin, a tractor dealer, garden plots, an apple orchard, and a farmers market. The experience staff directs and explains what happens to food from a starting point to the last step in the process at the grocery store. To learn more about the Farm Friends Barn exhibit, please click here.